There are over 20 golf courses on Mallorca and the nearest to Calas de Mallorca at Val d'Or Golf is only a 10 minute drive away. It is a well laid out course and in an ideal setting. A round of golf will cost between 85 and 112 € depending upon the time of the year. You can hire clubs at 34€ and a buggy car at 45€. There are also four other good courses all within a 40 minutes drive from Calas de Mallorca, however, if you want a cheaper option you can always play Mini Golf - there are two of those in Calas too. When it opened in 1985 Vall D’Or was a nine-hole courses designed by Bill Bendy. 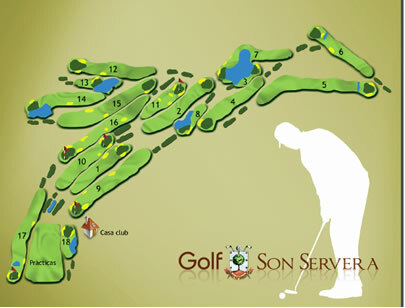 His original nine holes, which now form the back nine, are set amongst a variety of trees; carob, olive, almond and, of course, pine trees and compared to the outward nine are very hilly. The holes that currently make up the first nine were designed by Bradford Benz and opened in 1993. They too are set amongst trees but mostly pines. However, in between the trees you get spectacular views of the Med. looking out towards the resorts of Porto Colom and Cala D’Or. 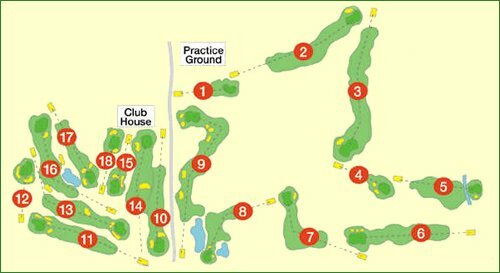 Unlike the back nine which are very compact fairways, the opening nine holes are spread out more. As a unique members club and the second oldest club on the island of Mallorca, Son Servera 18 hole course is situated below a range of pine clad mountains with glorious views over the bay of Cala Millor. First opened in 1967 to a design by John Harris / Francisco López Segalés, the club has a large contingent of British members, and both experienced and rookie players will enjoy their game through challenging lakes and bunkers. After your game, the club is renowned for its friendly post-round atmosphere in the club house with views over the 18th hole towards the sea. Pula Golf is one if the island's more exclusive courses, and the high green fee reflects this. Pula opened in 1995 and despite being a relatively new course it has already hosted some prestigious tournaments which have attracted top names from the world of sport and entertainment. It is a fairly flat course and commands beautiful views of both the local mountains and the Mediterranean sea. The exclusive Restaurant S'Era de Pula is frequented by the Spanish King, Juan Carlos when he is in Mallorca. Capdepera probably offers some of the most spectacular views of any Mallorcan golf course. The view from the 15th tee is something worth playing this course for..
Capdepera opened in 1991 and was originally a flat nine hole course but the addition of the extra nine holes changes the complex of the course completely because it contrasts to the flatness of the first nine by rising into the Arta mountains. The Roca Viva Restaurant is worth a trip to whether you are a golfer or not. Canyamel makes up the four local courses and is set in a natural valley which its designer used to its fullest and at 6,000 metres it offers a real test of any golfers ability. The course opened in 1989 and like so many Mallorcan courses, it offers fantastic view across the Med. On a clear day you can see Menorca from the 5th tee. Many natural stone walls have been left intact and form part of the course and right in the middle of the 9th fairway is an old stone cottage - guess where your ball always ends up? Of course, right behind the cottage!.